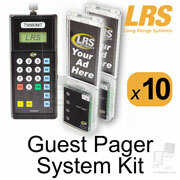 Choose Option 1 below for the standard 10-pager guest system. Choose Option 2 below to upgrade the standard T9560MT transmitter to the T7470 Freedom model for greater range, programming features and text and voice paging via internet connection. Custom Systems: Please call 805-375-7000 to order custom systems. Custom upgrades with Lobster, pizza and AdverTeaser paddle pager upgrades are also available.